Darcey Bussell, Royal Ballet Company, Royal Opera House, Covent Garden. Dress rehearsal of Tchaikovsky’s Sleeping Beauty. Photo © David Secombe, 1994. 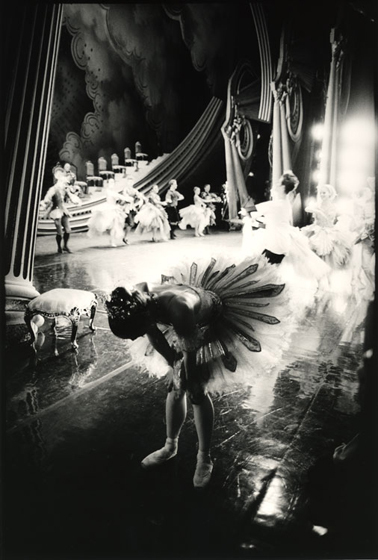 The most magical glimpse I ever caught of a ballet was from the road in front, from the other side of the road, one night when two doors were suddenly thrown open as I was passing. In the moment’s interval before the doors closed again, I saw, in that odd, unexpected way, over the heads of the audience, far off in a sort of blue mist, the whole stage, its brilliant crowd drawn up in the last pose, just as the curtain was beginning to go down. Ballet is one of those art forms – like poetry and jazz – which may be cheerfully disparaged in polite conversation. Such discussions offer opportunities for the uninterested to dress up their prejudices at the expense of a form which is seen as a minority interest, the province of the uncool or the far too radical. I confess I shared a similar ignorance, even hostility, to dance until I started photographing it. I had been looking forward to seeing opera in the raw and regarded the ballet as a rather irritating add-on to my obligations on the Royal Opera House project. You see something on television and arrogantly assume you know enough to hold an opinion. As it turned out, I found the ballet thrilling and opera a comparative let-down (as theatre, anyway); but the dance was a real discovery. The staggering physicality of dancers at their physical and artistic peak: the noise of the corps de ballet thudding onstage is a shock in itself. Standing off-stage, or just in the wings – as I was when I took the picture above – gives you a glimpse of what it costs to defy gravity; the strain of the job showing just outside the frame of the proscenium arch. I went from total skeptic to convinced enthusiast: a faintly humbling position for a sedentary, overweight photographer to assume. Some doubts remain. The Royal Ballet’s version of Daphnis and Chloe was a disappointment. Ravel’s rapturous score concludes with one of the great orgiastic frenzies in all art, but the action on stage was something akin to Morris Dancing, with the fabulous Viviana Durante and company poncing about with over-sized handkerchiefs. Even Bernard Haitink’s conducting couldn’t compensate for the absurdity of that.